The vividness and intensity of a color is represented by its saturation. Depending on the presence or absence of this saturation, colors can broadly be divided into chromatic and achromatic colors. An achromatic color is a one that lacks hues such as white, grey and black, and a chromatic color is a color which has even the slightest amount of hue. 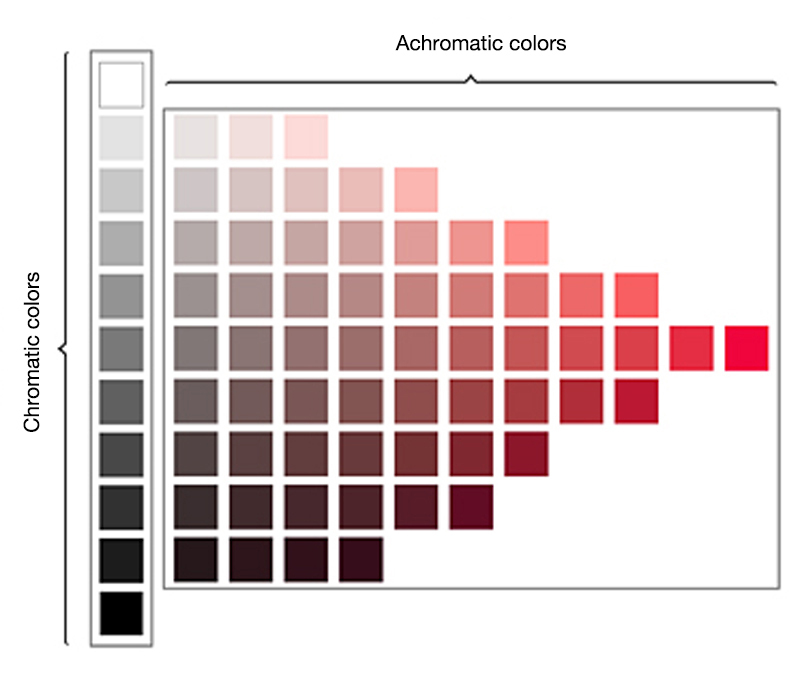 Achromatic colors (white, grey and black) have lightness but no hue or saturation. They can be created by mixing complementary colors together. Chromatic colors, on the other hand, have characterizing hues such as red, blue and yellow, as well as saturation, which is an attribute of intensity, in addition to lightness. The elements of hue, lightness and saturation found in chromatic colors are referred to as the three attributes of color, and specific colors can be represented by stipulating the values for each of these attributes. * The chart shown is only an approximate display of the relationship between colors and is not an accurate recreation. Colors also appear different depending on the viewing environment.